The Family Limited Partnership is an outstanding ENTITY, VEHICLE for providing the highest degree of law protection for family wealth. When used as part of a properly designed overall strategy, it�s an excellent ESTATE PLANNING benefits when used with an assets protection trust. The overall structure avoid the cost and expense of PROBATE, it reduces the estate size and lowers income tax by shifting income to lower tax bracket family members. It provides an unsurpassed level of asset protection can be accomplished. In the old days individuals seek to protect their assets they utilize an (IREVOCABLE TRUST), the problem with such method the individual will lose the control of his assets and he is under the mercy of the TRUSTEE of the IREVOCABLE TRUST. The FAMILY LIMITED PARTNERSHIP, in addition to the assets protection it accomplish the most important need, it gives the individual the complete control of HIS/HER assets, he/she will never lose control or give up control of their assets to a third party. The FAMILY LIMITED PARTNERSHIP can be used as a very effective Prenuptial / Postnuptial agreement that is very hard or next to impossible for a court to VOID it. It will accomplish the assurance and security of the Prenuptial / Postnuptial agreement and LAWSUIT protection. The FAMILY LIMITED PARTNERSHIP is Your Legal Shield Against any Predator. 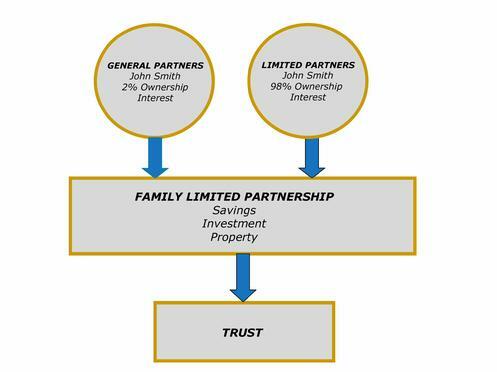 The FAMILY LIMITED PARTNERSHIP formation is similar to Limited Liabilities Company or Corporation, instead of having a President, share holder or manger, it has two OWNERS Called GENERAL PARTNER and LIMITED PARTNER. The most important part of the FAMILY LIMITED PARTNERSHIP is the operating agreement, a well structured agreement that will provide the protection and flexibility you need during your life time and beyond. Under normal arrangement, The Family Limited Partnership is set up that the HUSBAND and WIFE are each General Partner and own certain percentage interest of the PARTNERSHIP, the remaining interest are in form of LIMITED PARTNERSHIP interest, owned by the HUSBAND and the WIFE directly or indirectly or any family member depending on the individuals circumstances and their objective. After setting up the FAMILY LIMITED PARTNERSHIP (FLP), all family assets are transferred into it, including the family home, investments and business interests. When the transfers are complete, Husband and Wife no longer own a direct interest in these assets. Instead, they own a controlling interest in the FAMILY LIMITED PARTNERSHIP (FLP) and it is the FAMILY LIMITED PARTNERSHIP (FLP) which owns the assets. Husband and Wife as general partners, they have complete management and control over the affairs of the FAMILY LIMITED PARTNERSHIP and can buy or sell any assets they wish. They have the right to retain in the partnership proceeds from the sale of any partnership assets or they can distribute these proceeds out to the partners. Joint relationships, Business partnership, living together and joint business are the most significant sources of POTENTIAL LIABILITY. Each partner is liable for any negligent acts committed by another partner. JOINT AND SEVERAL LIABILITY means that a partner is not just responsible for his share of the obligation. Instead, each partner is responsible for the entire amount. If your partner cannot or will not pay his share, you pay the whole amount. Creating an asset protection plan to insulate your assets from any potential creditor or lawsuit is the most important plan to your financial well-being. A Family Limited Partnership will provide you with Five significant advantages that cannot be obtained through any other vehicle. 1. Discourage Lawsuits. Assets that are protected in the Family, since you do not own any assets in your name individually, the creditor has nothing to go after and place a lien on or siez your bank account. 2. Family Limited Partnership cannot be seized by a judgment creditor. It is unlikely that someone will want to sue you if they do not believe that they will be able to collect a judgment. 3. Income Taxes. With state and federal combined tax rates of 50 percent, overall family income taxes may be reduced by shifting income to lower bracket family members. This can be accomplished by gifting some limited partnership interests to children or grandchildren who are fourteen years or older. 4. Reduce the estate size of up to 35% since the PARTNERSHIP Interest is not MARKETABLE TO THE PUBLIC. 5. Gifting percentage of the Partnership to BENEFICIARIES over a period of years it again reduces the size of the estate. The Family Limited Partnership is a PASS THROUGH entity, there is no potential for income tax on it, (DOUBLE Taxation), and the Family Limited Partnership is not a taxpaying entity. A partnership files an annual informational tax return reflected on the General Partners Social Security Number, it set up it is income, losses and expenses, and it does not pay taxes on its income. The net income is passed through from the Family Limited Partnership to the individual PARTNER. Each Partner claims his share of income or loss on his own TAX RETURN.